This creative take swaps raw fish for the hydrating summer fruit. “Crisp toasted nori adds a natural source of iodine which is essential for thyroid health and metabolism,” says New York City-based recipe developer Laura Rege. And don’t worry if your watermelon is slightly under-ripe, it will still work well says Rege. Place the watermelon and scallion in an airtight container. Pour the poke dressing into a small airtight container. Place the sushi rice and avocado in separate airtight containers and store everything in the fridge. Combine the nori and sesame seeds in a small sandwich bag and store at room temp. 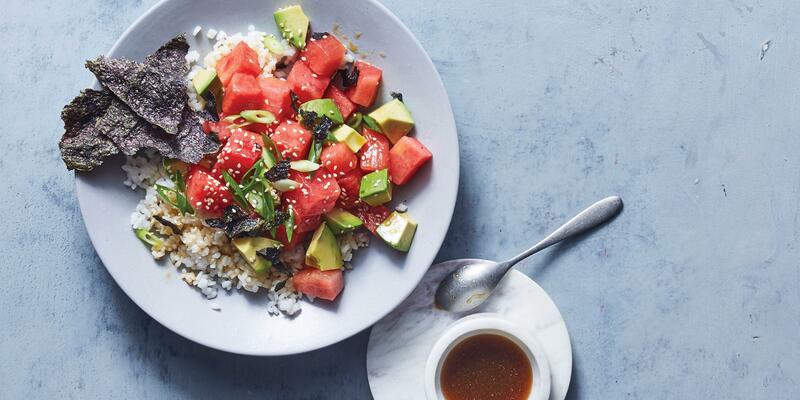 Dice the avocado and combine with the watermelon. Add the rice then pour desired amount of the poke dressing over top. Sprinkle with sesame seeds, and garnish with nori by crumbling it into pieces.